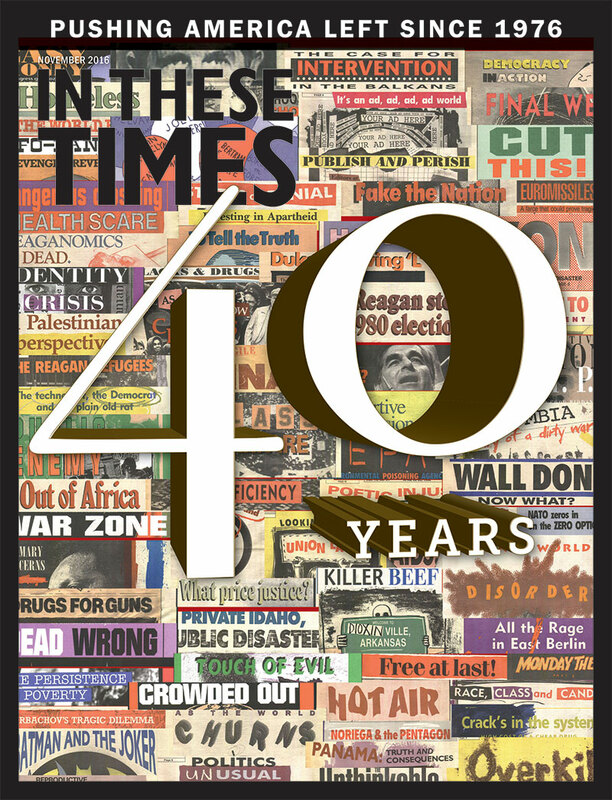 For more than a decade, these words appeared on the masthead of every issue of In These Times. They were not intended simply as lofty sentiment. When the paper was founded in 1976, a real transition to socialism seemed possible. As global economic stagflation rose during the Carter administration, In These Times predicted that the end of unbridled post-World War II growth would destabilize capitalism and called on socialists of different persuasions to “forge a powerful unity capable of defeating social democratic reformism and capitalist reaction.” The paper's founders saw the social-democratic welfare state as inadequate to this moment. A 1977 editorial, “Social Democracy or Socialism?” declared that “with the world capitalist system reaching the end of its expansionist epoch, the prospects for social democracy are increasingly bleak.” To maintain profits, corporations would rebel against the higher taxes that supported social welfare programs. If governments refused to comply, capital would flee by outsourcing production or slowing investment, causing high unemployment. Thus, the only way to defend social democracy was to move beyond it, by taking democratic control of investment. 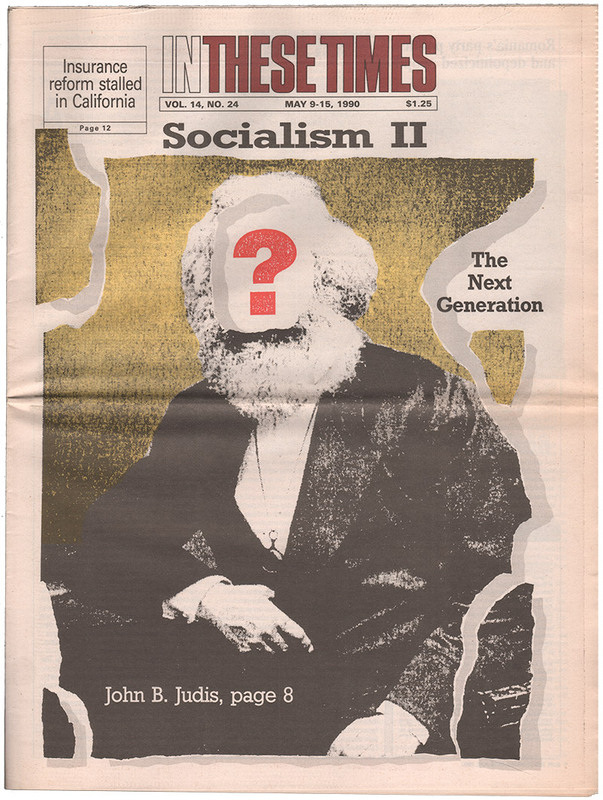 A 1990 cover story on socialism in America by John Judis. Although the paper was intended to be a broad-tent socialist publication, In These Times’ founders believed that democratic socialism could avoid the pitfalls of authoritarian Communism, namely by embracing democracy as both a means and an end. The democratic socialist presence in U.S. politics consisted primarily of two groups: the New American Movement (NAM), largely veterans of Students for a Democratic Society, and Michael Harrington’s Democratic Socialist Organizing Committee, which evolved out of the anti-war wing of Eugene V. Debs’ Socialist Party. Most of In These Times’ founders had helped found NAM and would later support the 1982 merger of the two to form Democratic Socialists of America (of which I am a sitting vice-chair). In Europe, a more assertive democratic socialist movement was emerging. Many student activists of the 1960s had joined ascendant socialist parties bolstered by the end of fascist rule in Greece, Portugal and Spain. Correspondent Diana Johnstone closely followed the developments in France, where FranÇois Mitterrand, after uniting Socialists and Communists to win the presidency in 1981, promptly nationalized nearly 25 percent of the nation’s industry and passed legislation enhancing union power. Meanwhile, the Swedish Social Democrats nearly succeeded in implementing the Meidner Plan, which would have used corporate taxes to gain majority public ownership of Swedish firms. The global corporate elite, however, did not stand idly by. In These Times’ predictions about the end of the postwar boom proved correct. Western capital outsourced industrial production and abandoned the post-World War II social contract between capital and labor. Thus began the neoliberal program of cutting taxes on the rich and corporations, curtailing state guarantees of union rights and trimming or outright privatizing social welfare. In reaction to this growing hegemony of the Right, the leadership of most social democratic parties, as well as the Democratic Party, adopted “third way” politics. Resigned to capitalism, they came to see their role as implementing a less vicious form of neoliberalism. Over the next 30 years, these bipartisan neoliberal policies would weaken labor, increase inequality and stagnate living standards for working families. 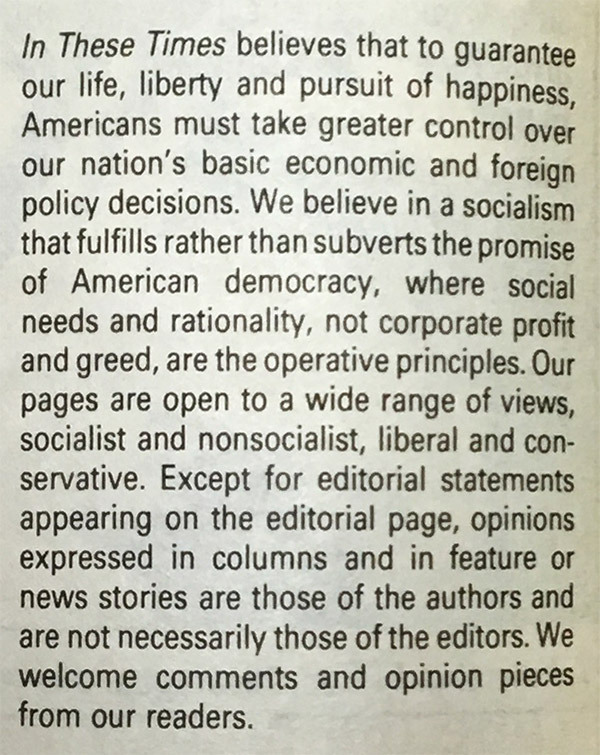 Mission statement from the masthead of an early issue of In These Times. During this period, In These Times could do little but chronicle the Left’s defensive battles to preserve labor rights, reproductive freedom and the gains of the civil rights movement. Editorials counseled DSA to challenge liberal Democrats by running open socialists against them in party primaries to put democratic socialism on the national agenda (see "Pushing the Democratic Party Left"). And, in an age of conservative national dominance, they urged socialist elected officials to return to the tradition of “municipal socialism,” affectionately known as “sewer socialism,” that had flourished in cities like Milwaukee as late as 1956. By 1989, In These Times had quietly removed the word “socialist” from its masthead. Readers continued to turn to the publication for coverage of the resistance to neoliberalism: opposition to NAFTA and Clinton’s welfare reform, the anti-globalization movement of the late 1990s and the anti-Iraq War movement during both Bush administrations. But one rarely read editorials or articles advocating for democratic socialism. Enter Occupy in the fall of 2011, which rekindled a radical—if not explicitly socialist—politics, and the election of an open socialist, Kshama Sawant, to a non-partisan seat on the Seattle City Council in 2013. Following more than a decade of “pink tide” socialist governments in Latin America, grassroots resistance to decades of austerity swept Europe with the rise of Podemos in Spain, Syriza and Popular Unity in Greece, and Jeremy Corbyn’s election to the leadership of the formerly neoliberal British Labour Party. In the United States, the most antisocialist of capitalist societies, democratic socialist Sen. Bernie Sanders (I-Vt.) won 12 million votes in the 2016 Democratic presidential nomination. As I wrote in a January 2016 cover story, Sanders’ program would have sounded to In These Times’ founders more like social democracy than democratic socialism. He did not run on a program of public or worker ownership of major firms. His platform called for defending and extending New Deal liberalism by strengthening labor rights, enacting a massive public jobs program to rebuild U.S. infrastructure and fund alternative energy, creating a truly universal “Medicare for All” healthcare system, and establishing publicly funded child care and tuition-free higher education. Furthermore, bleak prospects have moved millennials to the left. A December 2011 Pew poll found that more 18 to 29-year-olds in the United States held a favorable view of socialism (49 percent) than capitalism (46 percent). Many millennials associate capitalism with inequality, student debt, skyrocketing rent and a stagnant labor market. Though most millennials likely could not outline the structure of a democratic socialist economy, they believe in expanding democracy into the economic and social sphere, and combatting racism, sexual oppression and environmental degradation. The major challenge for the emerging post-Sanders trend in U.S. politics will be to broaden its racial composition. While the campaign fared well among millennials of color, it struggled to gain support among older Blacks and (less so) Latinos, as well as older women of all races. A socialist trend in U.S. politics would place greater emphasis than did the Sanders campaign on racial justice work, led by progressive organizations rooted in communities of color, as well as become more explicit in its commitment to gender and sexual equality. The reemergence of the term "democratic socialism" in mainstream politics partly explains In These Times’ paid subscriptions spiking to an all-time high of more than 39,000 and DSA growing from 5,000 to over 7,800 members in just the past 12 months. Perhaps it will also lead In These Times to recognize the continuing relevance of its socialist roots. None of the reforms in Sanders’ platform—many of which are now reflected in the official Democratic Party platform—can be won without reviving the labor movement and fully legitimizing democratic socialism. Sanders has called for a political revolution. That revolution will not occur through one electoral campaign, but rather through a revival of the power of social movements and through an organized, visible socialist presence in mainstream politics and in the press—a role that ITT played in its formative years, and may yet get the chance to play again. Joseph Schwartz is a professor of political science at Temple University. He is a Vice-Chair of Democratic Socialists of America and the author, most recently, of The Future of Democratic Equality: Reconstructing Social Solidarity in a Fragmented U.S. (Routledge, 2009).